The school that I have selected is the one that provides distance education from early childhood level to Year 13. The school has regional offices all throughout New Zealand and at present is in the process of decentralizing their services even more. The current e-learning approach of the institution is going through the empowerment phase in relation to eFLP framework. Personally, I would place the school at the extending stage if looking at the process of decentralizing the school services. The capability, profile and visibility of eLearning both within the school and across the broader education sector and the increasing contribution it is making to the achievement of the school’s strategic visions and goals have also increased substantially. e-Learning offers a unique opportunity for school to provide individualised learning programmes due to the flexibility offered by the delivery method and the capability for teachers to proactively manage, create, and offer specific and individual learning opportunities. When implemented and utilised effectively, this flexibility leads to improvements in student achievement, presence, and engagement. The school vision integrates e-learning throughout. The school’s approach to eLearning must also viewed against key national and international trends in educational use of technology. These include the blending of distance education with classroom practice across the sector, the potential development of a National Education Network based on advanced networks, the proliferation of third party digital content, and a paradigm shift in media creation and ownership propelled by developments in web technologies and diminishing ICT costs and copyrights. The professional learning in on going, open and safe. There is ongoing PDs going for staff every week on various ICT use in teaching/learning/administration. The schools also provide free Microsoft courses to staff and students as well. The implementation of personalised learning has been spearheaded by school-wide professional development that will continue in 2014 and beyond. This professional development supports regional teams of teachers to use information they have about students to develop and adapt programmes to meet students’ needs. Technology is one of major form of communication with students and parents as well as with other staff. ICT also provides a range of communication tools for students and their caregivers to interact with the school and better access to community resources. Culturally inclusive practices includes the capability of eLearning and specifically its use of multimedia, plays a core role in the achievement of Maori learners through its flexibility and capability to deliver via Te Reo Maori, audio and visual media and experiential learning. Through the delivery and implementation of the Systems Replacement Project (SRP) and specifically the new Online Teaching and Learning Environment (OTLE) as well as key personnel and capabilities within school, the school has positioned itself to have the capability and resources (both human and systems) to take advantage of the opportunities that eLearning and ICT provides our students, teachers, and broader community. There is a whole school virtual network for student learning as well as for staff which is safe and flexible. There is efficient administration network of technology for effective management and organizational work such as (SMS). School wide system for maintenance and development is available. There is very efficient technical support with remote server connections as well. Help is available in a flick of time. Whatever the technology, learning is the vital element. 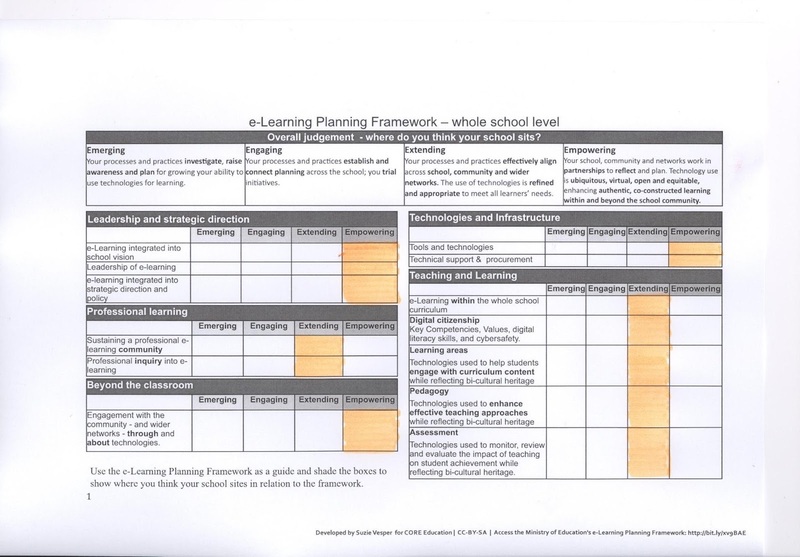 E-Learning is an important element in the evolving distance learning pedagogical framework within school and is key to the new approaches to learning required to meet the learning needs of individual students. Providing access to learning activities through a range of ICT applications and services also provides students opportunities to develop a range of 21st century skills and competencies that are increasingly required for success in the workplace and further education. E-Learning is fundamental to the effective delivery of personalised learning programmes. E-Learning provides the school with many ways to connect with students and engage them in learning. School recognises that some of the students have no or limited connectivity. The school has improved this situation by developing community relationships that provide students with access to safe and reliable connectivity such as in local libraries and having regional centres where students visit to work. The school shapes the review and development of courses ensuring that the approach chosen for each course best meets the learning needs of students. Increasingly, as students become more independent, the balance of activities in the distance environment will become less focussed on instruction and more on experience, with teachers facilitating and supporting the growth of a student’s personal knowledge networks. The use of different ICT and/or media needs to reflect learning needs and context. The idea is to match the learning intent with the eLearning method and tools that can deliver those learning outcomes within the learner’s own context and capability. Over the next two to three years the contribution of eLearning and ICT will increase, as the school deploys a greater proportion of courses onto the OTLE and more courses and content are delivered via eLearning. In future, the role and delivery of eLearning and ICT must fit within the school’s business practices. It should not restrict or impinge on the opportunities for learners who are unable to participate in eLearning. 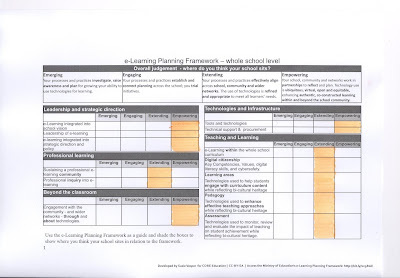 To this end, the school has developed an e-Learning content development framework which sits alongside current business practises offering enhancement through eLearning, whilst ensuring no student is excluded or restricted in their capability to achieve and succeed.